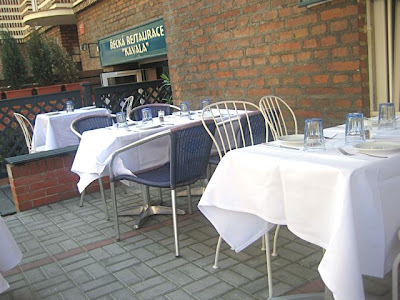 V had wanted to try Kavala, the Greek restaurant in the Dejvice neighborhood, for a long time. She first noticed it when we ate across the street at Da Emanuel. We had some time on a warm and sunny weekend day, so we headed over and found a table outside. Unfortunately, the tables were in the shadow of the interesting-looking brick building. Da Emanuel is on the sunny side of the street. Our friendly, young waiter brought us some tasty, crusty, chewy bread. It came with excellent green olives stuffed with almonds and pit black olives. We both preferred the green. I ordered a large sparkling mineral water. 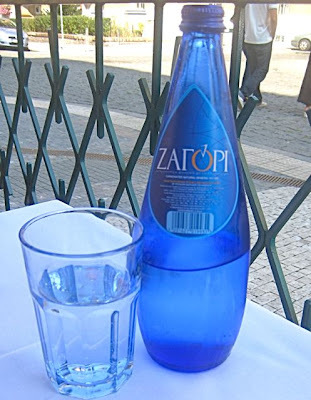 We received a .75 liter blue bottle of Zagori, a Greek brand (95 CZK). It had a hint of salinity. Despite its Hellenistic provenance, I would have prefered Mattoni, but it was fine. V generally likes to keep costs down and usually has decent luck ordering the house wine. So she got a .2 liter glass of the house red. Great color. I took a sniff and was pleased. I took a taste and was even more impressed. Wonderful stuff. I didn't ask exactly what it was, but based on some text on the receipt, I believe it was the Nico Lazaridi Merlot. I'll get back to you about the price later. 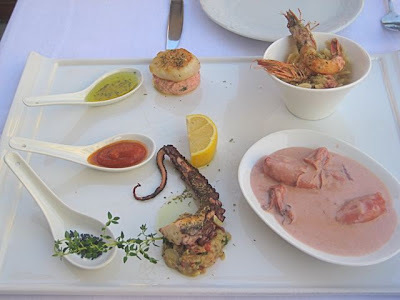 We decided to split an appetizer, the Thalasinos Mezes, a mixed seafood plate (320 CZK). The presentation was very attractive. The portions of each item were quite small, and the plate looked sparse for the price. But almost every bite was delicious. I particularly like the grilled octopus. Next, we savored the perfectly seared scallop. It rested on creamy, tangy taramosalata. We wished for more of both. There was calamari in a white wine and fish roe sauce. The squid was fresh, but just a tiny bit rubbery. I prefer the texture when it is lightly grilled. The sauce was very nice. Our least favorite, but still OK, were the grilled shrimp on top of a little bowl of orzo. The shrimp were just too insubstantial, both in size and flavor. On the side was a terrific olive oil. There was also a tomato sauce in a spoon, which looked like ketchup but was less sweet and had spices that tasted like cinnamon. For my main course, I went for the pork souvlaki (210 CZK). It was creatively served on a skewer, suspended between two metal posts. In between the meat were grilled red onions and green peppers. Underneath, there was a great tzaziki-like yogurt mixed with fresh, chopped mint. It was great and combined perfectly with the juicy, smoky meat. Again, I wished there was more of the condiment. 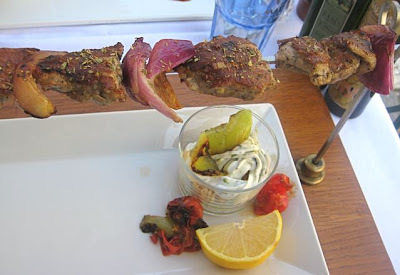 The pork was tender, and I enjoyed it more than the souvlaki at Taverna Olympos, which can be tasty but dry. 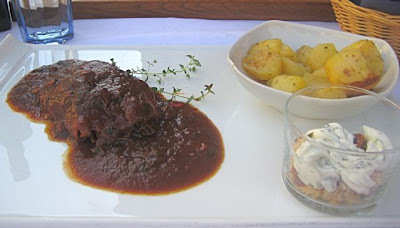 V ordered the lamb in a spicy tomato sauce with baked potatoes (350 CZK). She loved this dish. The sauce was not very spicy, but had some interesting seasoning. The potatoes were buttery goodness. On the other hand, I found the dish too salty, and thought the meat was a little stringy. She didn't let my negativity get her down and savored every bite. I felt the need for dessert and desired something cocoa related. I got the Chocolate Passion (110 CZK). The menu said it was made with Swiss chocolate, and I believe it. It was a mini-binge for a serious chocoholic. The dessert was smooth and rich, with a single cherry, syrup, and Greek candies on the side. 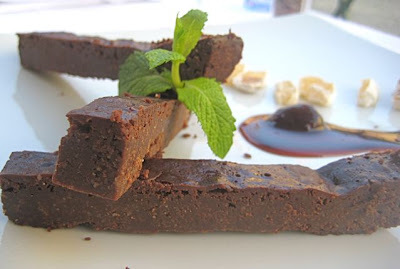 There was only one small issue -- the chocolate bars were slightly dry and crumbly. I knew this restaurant was more upscale than your average Greek joint, so I was expecting a higher bill than I'd get at one of those places. But I was still surprised when I saw the damage: 1493 CZK. I looked at the various items on the receipt. There was a 20 CZK cover charge per person. Not a heavy hit, but I hate when restaurants have covers. 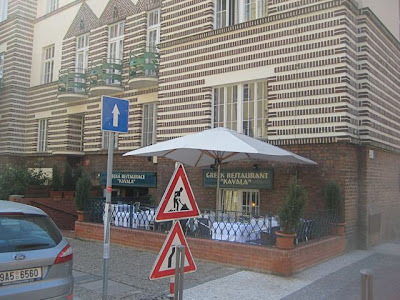 However, it was easier to stomach than the 45 CZK per person cover at Al Dente. But my eyes popped when I saw the charge for V's two glasses of red wine. They were 184 CZK each. Sure, it was great. I'd even say it was worth the money. But the issue was that we didn't want to spend that much. V called over the waiter. "Yes, is there a problem?" He asked. "I said I wanted the house red." "That's what I served you," the waiter replied. "Yes, but I wanted an inexpensive wine." "That's the cheapest wine we have by the glass." "Really? Well, if that's the case, you really should have mentioned the price. 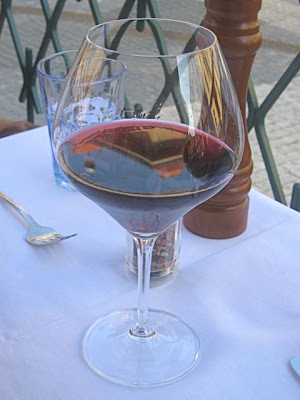 House wines in other restaurants are almost always quite cheap by the glass." She did all this with a smile. Then, she teasingly said to the naughty waiter, "You, you, you." It was pretty cute in Czech. She has this charming way of telling people they screwed up without turning it into an unpleasant scene. For us, anyway. "His ears turned bright red, she said as he walked away. We really enjoyed almost everything about our meal at Kavala. I don't regret our decision to try it, and we'd go again. But know this: V related the wine incident to a colleague. It so happened that the colleague had also eaten there. And he had the exact same experience of surprise when he saw the price for a glass of "house" wine. He wasn't happy about it. So, I can only partially agree with Plato. A good decision is, indeed, based on knowledge. But that includes a knowledge of the numbers. Nasty surprise at the end. But I find if Restaurants want to make extra money anywhere, it is wine !. Will try though. When you order house wine thinking that this is the wine chosen by someone for its qualities and, most importantly, affordable price. Right?? :) No matter how good the wine was, they should have informed you about the price. 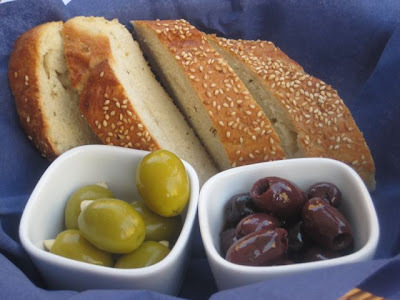 Are you into Greek food? There is a new Greek teverna opening up on Dukelskych hrdinu street, Prague 7. It used to be a big cukrarna. I saw them put on signs today and bringing in tables and stuff. Looked nice from outside. There is a Greek lady operating a hair saloon and Greek grocery nearby, it may be her opening this new spot. Will check it out as soon as they open up.